I prefer a larger corral because it gives the horse more opportunity to move around. Being bigger, it’s also easier to clean because the horse isn’t constantly walking in his manure and scattering it around. My corral is 24’ by 24’ reinforced with wire, typically called stud wire (4” by 6”). The wire serves two purposes. 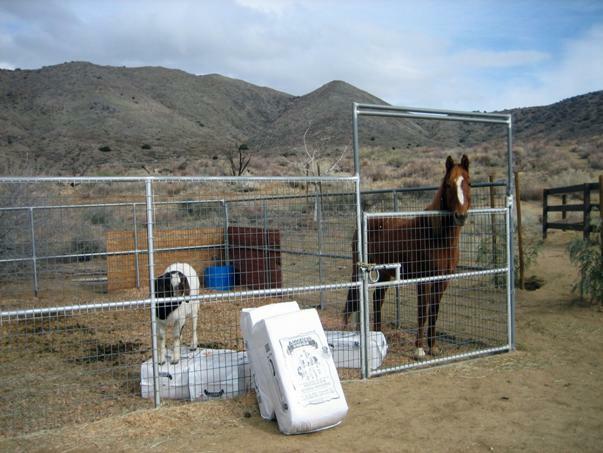 If your horse has a buddy, such as a goat, the wire keeps him safe from predators like feral dogs, coyotes, and bobcats. 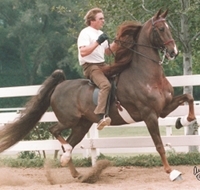 It will also keep your horse from getting cast—meaning that he rolls too close to the fence and discovers he can’t stand up again because he’s put a leg between the rails. While the condition doesn’t sound serious, your horse can die if nobody discovers him in time. I like to bed my horses in shavings—fewer fly problems, and he won’t rub sores on his hocks from the packed dirt, and smell like urine from rolling in it. Very few feed stores in this part of the country carry straw anymore because there’s less waste with shavings and your horse won’t eat them. Before I talk about actually cleanup, you’ll need to buy some tools of the trade. When you buy the pipe corral, buy the kind that have recessed feeders. Even though your horse will pull most of it down to ground level, where is how horses do it in the wild, the rubber mats will protect him from eating dirt with his hay. You will also need some kind of water tub. For one or two horses, particularly in the hotter parts of the country, an automatic drinker system is a waste of money. Now you have to buy a plastic “apple picker” to pick up manure, and an honest to goodness pitchfork with metal tines and a wooden handle to dig out the spots where he urinates. You will also buy a wheelbarrow, preferably one with a solid rubber (puncture-proof) tire. The fastest way to muck out involves sliding your apple picker under the poop pile, lifting the whole thing, and emptying it into your wheelbarrow. The only problem with that is you also pick up a lot of shavings. Next time, don’t dig so far under the pile. Shove your apple picker in about halfway, so all you dump into the wheelbarrow is manure. Then go back and dig out the rest. You won’t get as much as you did the first time, so once your apple picker is full, lift it up and wiggle it sideways, back and forth, to allow the shavings to fall through. When you think you’ve cleaned up the whole pile, rest your apple picker on top of the shavings and move it from side to side. Usually you’ll find many sizeable clumps of manure you would have otherwise missed. 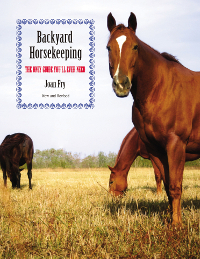 Some horses—I own one right now—urinate in the same place in their corral every time. That means you have to dig it out at least three times a week or you’ll have one very smelly pipe corral. In between, dig up the obvious wet spots and cover them with bedding from other parts of the corral. Bottom line: get rid of the road apples once and preferably twice a day, especially in summer (they attract flies), and don’t forget the urine-soaked shavings. Great blog for all horse lovers.